Informetica's popular report on User Activity, R106, has undergone some exciting and extensive development improvements. The most noticeable changes include improved visual display and the addition of a summary version with graphs. These changes will be available for you to review on preview sites on January 13, 2017. R106 will go live on January 25, 2017 when it will be viewable by enabled account types who have access to the report. Reports generated in HTML format now use a responsive design that is mobile-friendly. A new summary version of the report can be selected in Step 3 of the report wizard. 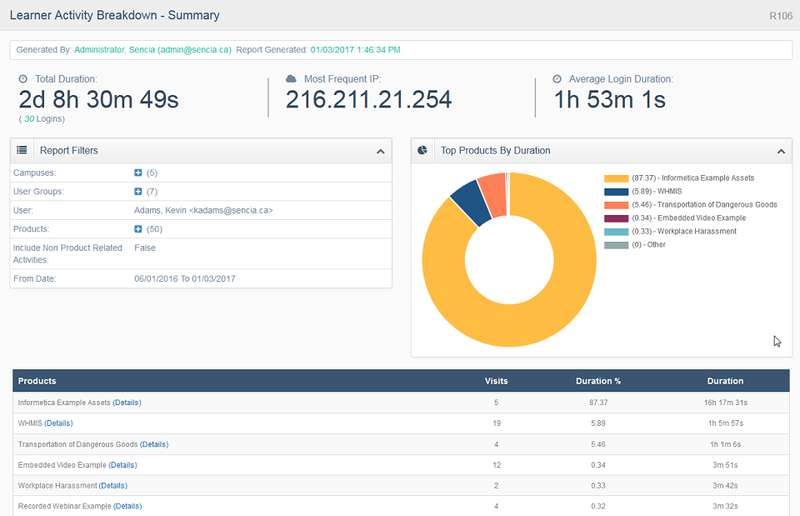 As opposed to the default view that diplays each login as a seperate activity, the summary version displays a summary of activity for each product visited. It also graphically displays the top products visited based on the total time the user has spend within them. Note that graphs are supported by IE 9 or higher and other modern browsers. The summary version lets you select a specific product to view more details on which assets the user visited. 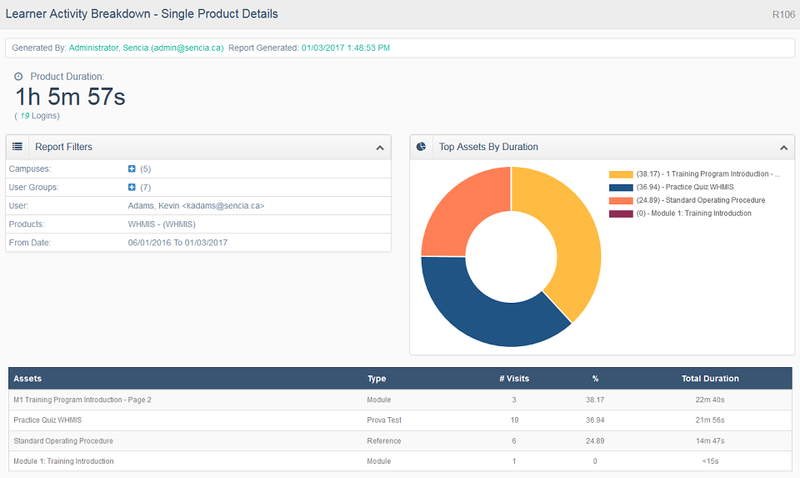 It graphically displays the top assets visited within the selected product based on the total time the user has spent on the pages. Note that graphs are supported by IE 9 or higher and other modern browsers. An improved visual display of the report header, data, and footer. Important summary information was added to the top of the report for quick reference. All filter criteria selected in the report wizard is now visible. Data is now displayed in a standard format (e.g. names and dates). Headers now remain visual when scrolling down long lists of data. Added a CSV download option. The Excel report download is now generated in xlxs file format and has been updated. Clients that experienced permissions issues due to Windows Security Updates will no longer have this issue (read more here). Optimized the development code to provide increased performance and stability. Removed inline styles to take advantage of CSS stylesheets for standardization, modernization and responsive considerations. Want R106 But Don't Have It? If R106 is not available on your site and you would like it enabled, please enter a SRS ticket to request the report.